World of Warplanes made its debut on Steam earlier this month, at last bringing another piece of the Wargaming catalog to Valve’s store with 12v12 dogfights amid the golden age of military aviation. This release is keeping pace on updates too, and two new planes have hit the runway and are ready for takeoff – bolstering the Japanese and American fleets. On the U.S. side, we have the Bell PN-39N-1 Airacobra. Armed with a full battery of guns, this one is equipped with four 7.62mm machine guns, two 12.7mm machine guns, and a 37mm autocannon. Like its namesake, the Airacobra is built for swift strikes that are tough to recover from. The Tachikawa Ki-94-I is manufactured for speed and performance, and is most at home at mid-to-high altitudes. Equipped with bombs and “outstanding firepower,” the Ki-94-I is built for hit-and-run missions that will keep the enemy guessing. Both planes are now live on the in-game store, and you can grab a deal on the pair from now until the morning of October 15. You can get all the details in the Steam announcement. Wargaming has provided some footage of the two new planes in action, as well. Check out the Bell P-39N-1 Airacobra below. 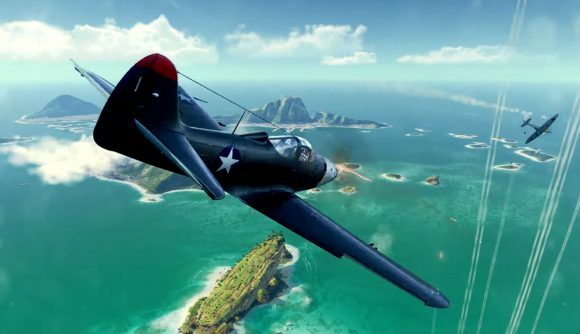 World of Warplanes recently joined World of Warships in making the jump to Steam, allowing both games to reach a new audience. The naval MMO has been keeping up with the updates too, adding monsters for a Halloween event – the perfect deep sea horrors to keep you up at night. Both games are free-to-play, whether you want to try them on Steam or directly via Wargaming.